Who says a nursery can only have one theme? “The jumping-off point was somewhere along the lines of midcentury-global-woodlands,” says designer Tyler Papp of Heather Fulkerson Interiors, who was guided by a Pinterest board from homeowner Lauren Mason on behalf of baby Parker, seen above. A charcoal-gray rocker from CB2 references midcentury design in an ergonomic way. The area rug’s colorful pattern references all the elements in the room. It’s from rugsusa.com, one of Papp’s favorite bargain sources. Cheeky woodland creatures from Potter & Mason spark the imagination. 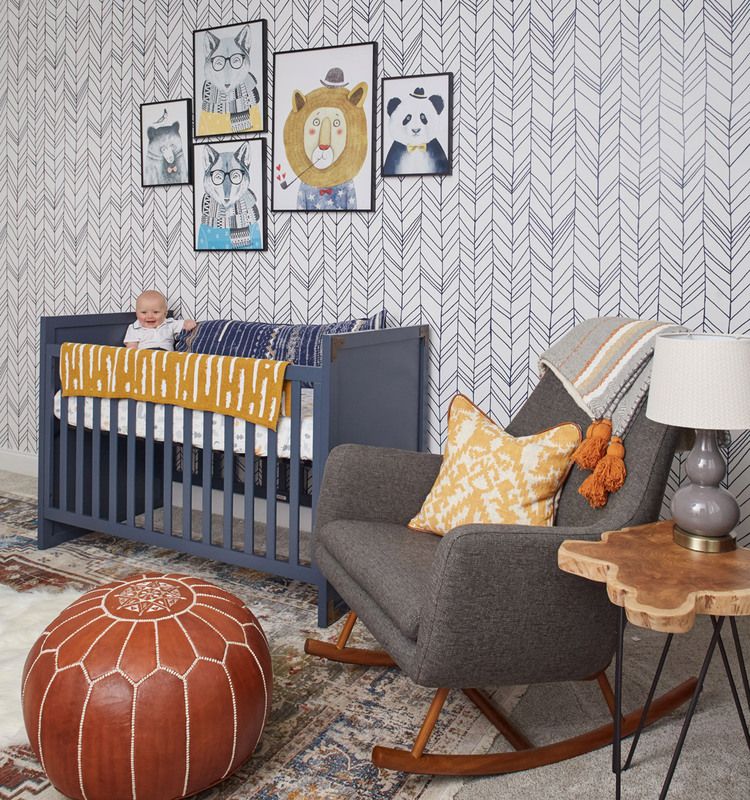 “I fell in love with the idea of a bold wallpaper accent wall behind the crib, so that was my initial inspiration,” Mason says. The designers found this peel-and-stick version on Etsy with just enough pattern for the Brookhaven nursery. A wood-topped side table fits the room’s organic theme and was a budget-friendly discovery from HomeGoods.